DIAL: Grey matte racing ‘exotic’ dial with orange markers, luminous trititum hour markers. Orange chronograph seconds & sub counter hands. CONDITION REPORT: Excellent condition, the case is unpolished and sharp with some light wear and small scratches. Dial is in mint condition. The moon print Speedmaster box has some slight peeling on the back, but complete with its insert. The papers are blank, but correctly printed in 1969. 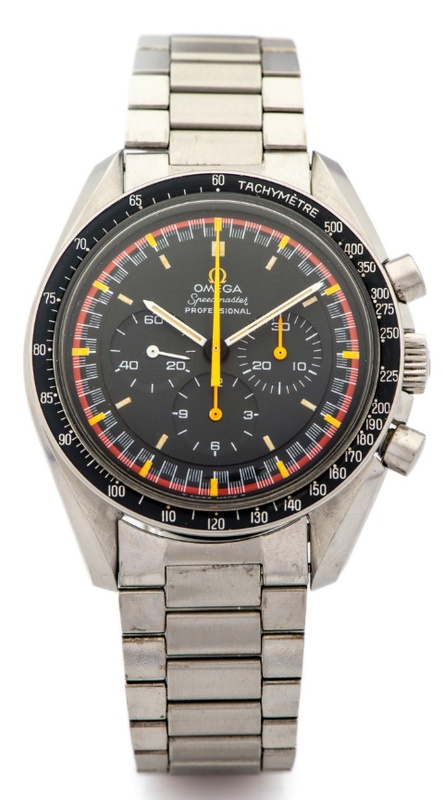 NOTES: In the late 1960’s and early 1970’s Omega developed racing dials for the Speedmaster. The Speedmaster Mark II was officially retailed with a grey racing dial that had orange accents and the hands for chronograph functions in orange color. It is thought that the same was developed for the 145.022, but very few have actually been seen. These extremely rare racing dial moonwatch Speedmasters are unique in their appearance and this version was the inspiration for the Japan Racing Speedmaster limited production (2004 pcs) model 3570.40 made in 2004. In addition, there is also an added logic to these racing dials as the Speedmaster was originally launched as a racer’s watch and came standard with a tachymeter.